Greg Meyerhoff, Barry Goldstein and Anne Salisbury reunite in Denver! We have known Barry Goldstein since 2008. Music is in his heart. He sees it as the “Universal Language of Love,” which can improve our quality of life at both a personal and global level. He creates music to open our hearts, remove blockages and bring us back to our natural state of health. This allows energy to flow, which brings about improved health. Certain pieces he has composed are perfect background music for Transpersonal Hypnotherapy sessions. At age two, Barry felt the notes of the piano moving through him and entering his heart as he inhaled. He knew, then, that the power of music was to be shared with the world. Since he was 14 years old, Barry has been working as a singer and songwriter. Since 1989, he has been producing music. Hospitals, hospices, companies and others use his music to relieve stress and remove blockages in the physical, emotional, mental and spiritual bodies. And since his spiritual awakening in 1996 and again in 2000, Barry has been a channel for healing music. His music assists us all in relieving stress and entering “the zone” where we can focus and achieve our heart’s true desires. In his “Ambiology Collection,” he brings the sounds of beauty and serenity into our bodies to increase our capacity for healing. He also facilitates private sessions and workshops using sound and vibration to release stress and promote balance and healing. Barry Goldstein has composed and produced for Warner Brothers, ABC, Fox, NBC and Lifetime Networks. His music has touched the audiences of Deepak Chopra, Marianne Williamson, Michael Beckwith, Wayne Dyer, Gregg Braden, Neal Donald Walsh, James Van Praagh, Brian Weiss and Gary Zukav, to name a few. He has provided ambient music for Shirley MacLaine and the Monroe Institute. In 2005, he won a Grammy Award for co-producing with Les Paul. 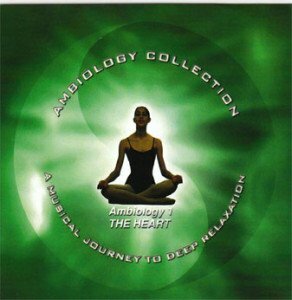 Barry Goldstein’s “Ambiology 1: The Heart.” Great music for Transpersonal Hypnotherapy sessions! Notice your current energetic state (mood). To what energetic state would you like to shift? Choose music that has a rhythm for entrainment and emotion and style appropriate for your desired state. Breathe in the music and the mood you desire. Then exhale what you desire to release. To relax and release stress, Barry suggests using music free of lyrics and familiar melody patterns, which might trigger previous emotional responses. Instead, the music should be continuous and at the tempo of the heart at a relaxed state. This is at 60-68 beats per minute. Barry recommends his “Ambiology Collection” as background music for Transpersonal Hypnotherapy and intuitive counseling sessions. These are free of melody and allow your clients to go where they need to go in their session. For the healing of heart issues in personal meditations, he recommends his new “Heart Codes.” This is explained further in our audio interview below. How Can Music Heal You? These are the questions we asked Barry. Hear his answers in our audio interview below. How can music, of any kind, bring about healing? How do you compose your music to help us heal? How can we pick music right for us? What background music do you recommend for Transpersonal Hypnotherapy, psychotherapy or any healing arts sessions? What music do you recommend to clear the space before or after seeing clients? How does melody affect us? How does your “Ambiology Collection” differ from your “Heart Codes” music? Which is better for client sessions? Which is better for personal work? What else do you want our listeners to know? 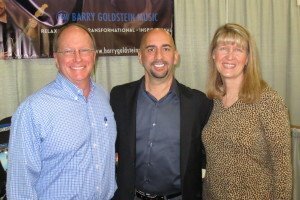 Listen now to the interview with Barry Goldstein, Grammy Award Winner, interviewed by Anne Salisbury, PhD and Greg Meyerhoff of GoIntuition.com. This is a 23-minute audio file. www.BarryGoldsteinMusic.com – Discover Barry Goldstein’s Music for stress reduction, relaxation, chakra balancing, emotional release, auric attunement and activation. He offers transformational workshops, corporate seminars and workshops for children. Attend his concerts or bring him in to play for your group! https://www.youtube.com/watch?v=7wy0di4qpJU Listen to a 28 min interview on YouTube: What Matters Most Show: Sound Healing with Barry Goldstein. Play Barry Goldstein’s Ambiology music with your clients.